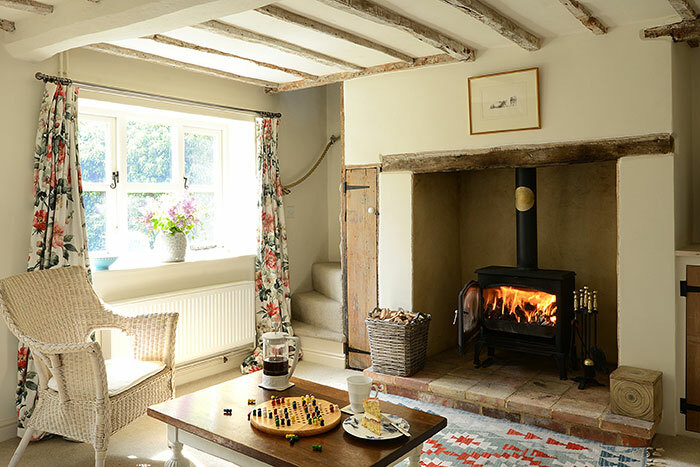 Guests’ comfort is our main priority, so the cottage is furnished to a high standard, making you feel immediately at home from the moment you walk in. The first room you enter is the sitting room, which is so serenely calm, making it is perfect for a quiet night in. All you will want to do is curl up on the comfortable sofa with a good book and a glass of wine, or indulge in a bit of TV. And on a chilly winter’s evenings, there is a wood burning stove which pours out heat, creating a very cosy ambience. The sitting room leads onto a beautifully hand-crafted kitchen which overlooks the back garden. It is well equipped with a dishwasher, fridge (with ice compartment), an electric oven and hob, microwave, toaster, kettle and, of course, plenty of crockery and utensils for your stay. 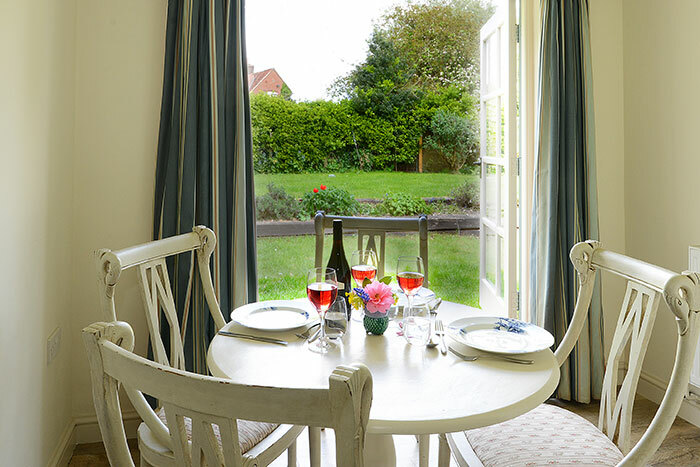 From the kitchen, you enter a light and airy room with a rustic cream painted wooden table and chairs. French doors open out onto a terrace which overlooks the back garden. This makes a perfect morning sun-trap to eat your freshly made breakfast whilst listening to the birds singing. Or even to re-cap on your day’s adventures over drinks and nibbles whilst enjoying Norfolk’s famous balmy summer evenings. There is also a downstairs bathroom with a free-standing shower. And should you need to do any essential washing during your stay, a washing machine is available for our guests use. Upstairs there is the en-suite bedroom which many consider the star attraction of the cottage. 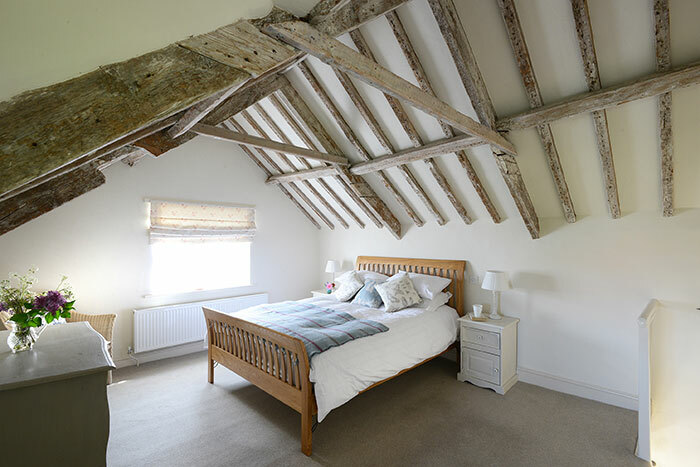 The original vaulted beams are exposed throughout the bedroom, allowing you to truly appreciate the cottage’s history. You will sleep soundly on a luxury king-sized bed, crisp cotton sheets, duck down duvet and pillows. The cottage’s peaceful surroundings will also ensure that not a sound will disturb your night’s sleep, guaranteeing you’ll leave feeling rested and rejuvenated. 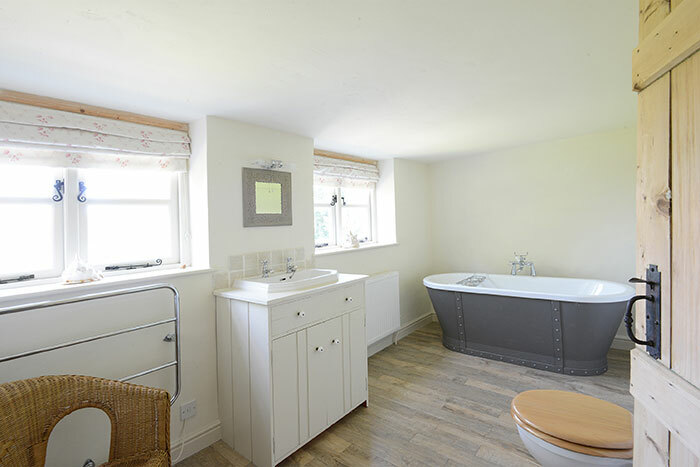 After a day exploring pretty Norfolk villages, beach walks and tasting what the great country pubs have to offer along North Norfolk’s coastal roads, you’re bound to want to take a long soak in the traditional free standing bath. After your stay, you will appreciate the meticulous detail throughout the renovation project, which has made Hill Cottage such a unique retreat, guaranteed to give you a wonderful break. And we’re confident you will be back. Our aim is to make our guests relax as much as possible during their stay at Hill Cottage. Should you have any problems during your stay at Hill Cottage, you can of course contact us. A weekly permit for the Albert Street Car Park, a five minute walk away, is provided. Parking outside the cottage is restricted to loading and unloading, all day Sunday and overnight.